The peacock mantis shrimp (Odontodactylus scyllarus), sometimes known as the harlequin or painted mantis shrimp, are found in the warmer waters of the Indian and Pacific oceans. While commonly known for their bright coloration, the peacock mantis shrimp has one of the most advanced eyes and vision systems in the animal kingdom, far beyond those we have as humans. 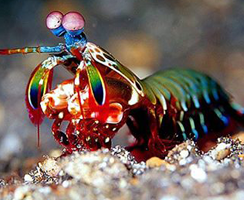 While we have three types of photoreceptors (red, green, and blue), the mantis shrimp have anywhere from 12-16. This means that not only can they see more colors than us, but they can also see well into the UV range! However, it’s not just their advanced visual system that makes peacock mantis shrimp unique. They also have some of the strangest, most powerful behaviors in the sea. Like many of their crab and lobster relatives, the mantis shrimp often dine on shelled creatures like crabs and mollusks. However, unlike their clawed relations, they do not use the same crushing force to break the shells. Instead, the mantis shrimp wind up for an incredibly strong punch. This deadly punch, with the speed of a .22 caliber bullet, can do some major damage on its own, but recent research has shown that it’s not just the force of the impact that breaks the shell. The high speed of their attack creates a cavitation force; this means that the velocity of their appendage is so high it creates a bubble near the site of impact. This bubble then implodes with water, creating a secondary, forceful shock-wave. Between the punch and resulting shock, most shelled creatures don’t stand a chance. While their active lifestyle and amazing coloration makes them highly sought after aquarium pets, you may not want to rush out to buy one – their immensely strong punch has been known to bust through aquarium glass! the whole lot it’s good to play this recreation.